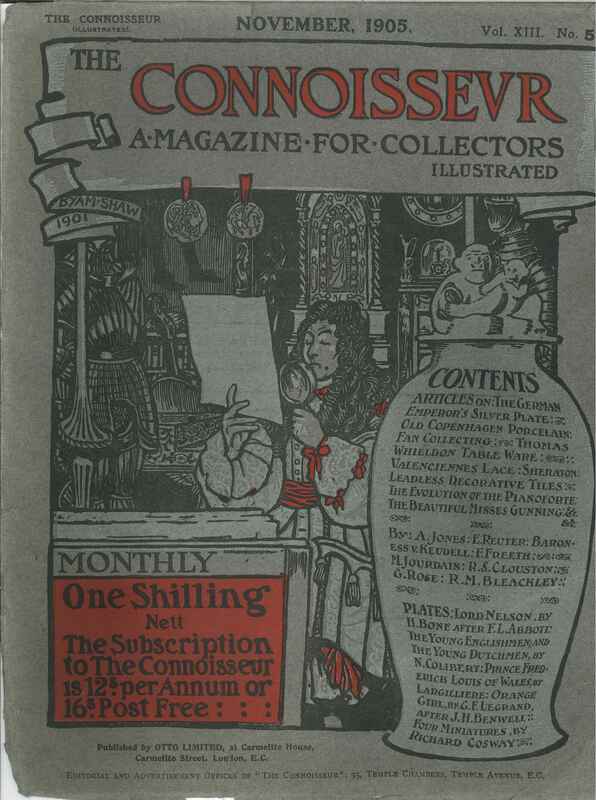 The Connoisseur (originally subtitled ‘An Illustrated Magazine for Collectors’) was born in September 1901. It survived nearly the entire course of the twentieth century, before passing away in February 1992. It was a British magazine, but it was also published in America. As the first editor acknowledged in the first edition, a magazine ‘devoted to any and every object that is or can be collected’ was a new thing. The editor’s mother also contributed to first edition, helping to create an image of The Connoisseur as a real person with her poem L’Envoi. In this she images the connoisseur as a child on the beach searching for beautiful shells, and explains the function of the magazine by paraphrasing Keats’ Endymion (1818): ‘Things of beauty, Joys for ever’. The editor himself, J. T. Hebert Bailey (1864-1914), was sure that his new enterprise would be a success, due to the significant ‘increase in the interest in and desire for things old and beautiful and rare.’ It was with this spirit of rarefied acquisitiveness that the magazine marketed itself at ‘a fastidious and critical public’. This formula was very popular, as shown by the fact The Connoisseur was acquired in 1927 by William Randolph Hearst (1863-1951), the American newspaper magnate and owner of Cosmopolitan. Despite this takeover, for the first 50 years of its life, the magazine remained remarkably consistent both aesthetically and intellectually. Despite the diversity of authorship, and the variety of subject matter, it is very tempting to see The Connoisseur uniformly as an individual, a real person, a trustworthy expert. Bailey clearly wished to create this impression as the first cover, designed by Byam Shaw (1872-1919), depicts an eighteenth-century collector surrounded by ‘things of beauty’ and inspecting a document with a magnifying glass (Fig.1). This was still the case in 1948 when The Burlington Magazine dropped its subtitle ‘For Connoisseurs’. 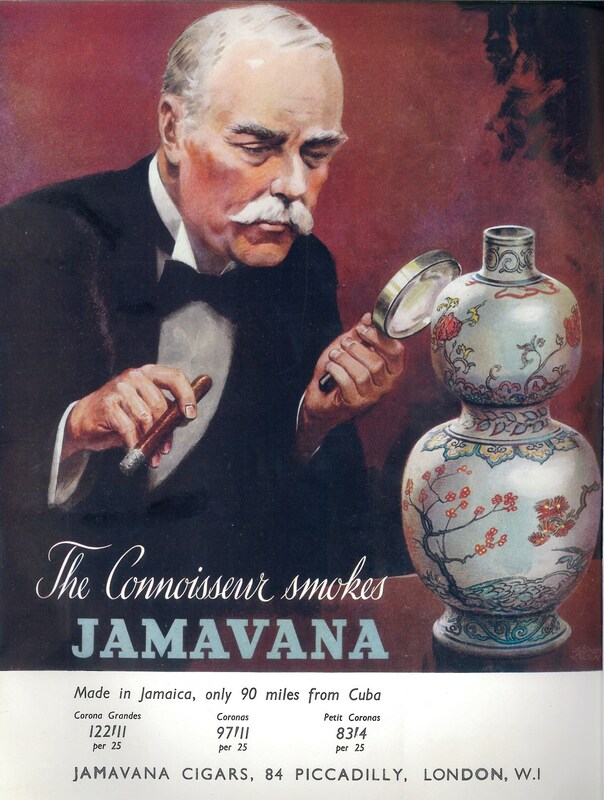 Justifying this decision, the editor explained that ‘the word “connoisseur” now conjures up a picture of an elderly gentleman in white bow tie and trim Imperial […] In one hand he holds an expensive cigar, in the other a magnifying-glass through which he peers knowingly at the contours of an oriental vase’. This description was not simply some cultural cliché of an elitist art-lover, but almost exactly recalls an advert running in The Connoisseur in the late 1940s which personifies the magazine as an aristocratic smoker (Fig.2). And it is true that looked at in a certain way The Connoisseur was a well-dressed middle-aged man. Looked at another way, however, and the magazine can be seen as itself a beautiful object, a collectable in its own right. Taking advantage of new printing technologies, The Connoisseur was lavishly illustrated, offering to the eyes of its readers the magically eclectic range of material objects it discussed: Armour, Spectacles, Stamps, Paintings, Tobacco Pipes, Prints, Costume, Cutlery, Majolica, Miniatures, Glass, Brass, Coins, Banknotes, Teapots, Tapestries, Japanese Prints, Peruvian Pottery, Chinese Bronzes… Appearances mattered to The Connoisseur, and it was a very stylish magazine, every section being accompanied by a unique woodcut header. Part of this visual attractiveness was the repeated illustration of images of young girls and beautiful women, particularly taken from eighteenth-century French and British painting. For instance, the March 1909 cover features the National Gallery’s Girl with a Kitten (attributed to Jean-Baptiste Perronneau, 1745, Fig.3). Also, throughout its first 50 years, The Connoisseur reliably demonstrated an admiration for George Romney’s paintings of Lady Hamilton (Emma Hart, Fig.4). The Perroneau pastel had previously been illustrated in 1902, accompanying an article by the then owner Lady Dorothy Nevill (1826-1913) detailing her own collection. 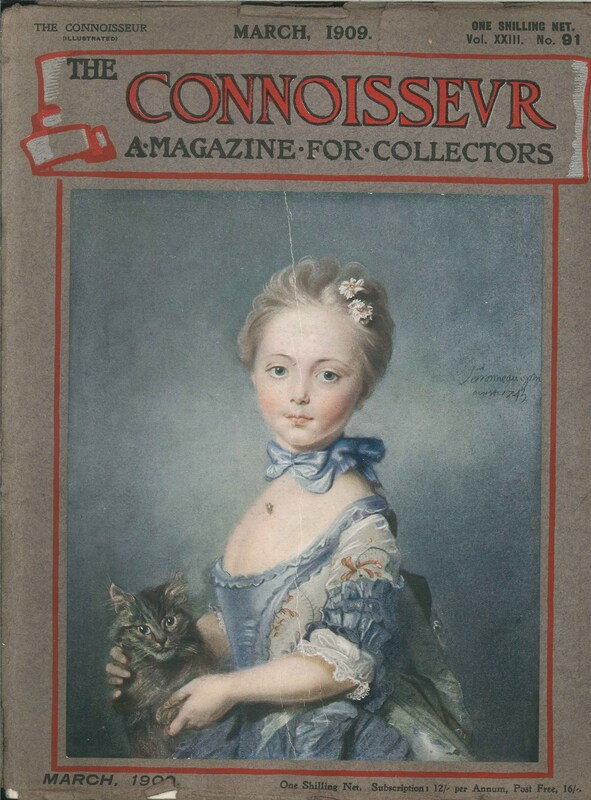 However, when Girl with a Kitten appeared on the cover of The Connoisseur in 1909 it was not specifically connected to any literary content, as was the case with many of the images of women. It may well be therefore that the primary purpose of these illustrations was simply to be ‘pleasing’. This embodies the attitudes of readers and collectors and of course the magazine’s editors. In the first issue of 1901, reporting on a sale at Christie’s on 27 April, The Connoisseur notes that at this auction the collector could compare the prices for male and female portraits by the same artist, for example a pair of portrait heads of Captain and Mrs Willet by Sir Joshua Reynolds, which served as an example ‘of the wide discrepancy in value which exists between the sexes in the auction room. Mr. A. Wertheimer cheerfully paid 1620 guineas for the lady, whilst the Captain was separated from his consort, though in every way her equal as a work of art, by a bid of 150 guineas’. Again in March 1909, in ‘The Connoisseur Register’, a section which advertised for ‘private individuals desirous of buying or selling works of Art’, one notice attempts to entice potential customers: ‘Private Collection of Old Masters. – Many ladies’ portraits’. The second editor, C. Reginald Grundy (1870-1944), continued these traditions. During his trip to America in 1926, just prior to the acquisition by Hearst, one newspaper reported comments made by Grundy to the effect that American girls diet too much and ‘are apt to sacrifice their looks on the altar of fashion’. However, the girls at Smith College reminded him of none other than Romney’s Lady Hamilton, and the paper records that: ‘He greatly admired these college girls’ (Fig.5). Naturally this reflects contemporary attitudes to gender, although it does so through the peculiar prism of connoisseurship, in which women function as aesthetic objects on which judgement could be passed and taste exercised, just like a painting or a print. The early editors of The Connoisseur wanted ‘reading’ the magazine to be pleasurable for the intended audience, meaning educated and discerning men. Although many female authors contributed to the magazine, and many women read it, The Connoisseur himself was male. For instance, an article from July 1905 on the Cricket paintings at Lords had been preceded with an article (authored by a woman) on Catherine and Elizabeth Gunning, or rather, ‘The Beautiful Misses Gunning’, which just happened to provide an opportunity for some more illustrations of Romney’s portraits of Lady Hamilton. The article begins: ‘To England belongs the honour of being the birthplace of those beauties whose charms caused such admiration – and no doubt, envy, hatred and malice – during the latter half of the 18th century’. Its attention to English beauties also demonstrates that The Connoisseur was very patriotic. Among its readership was the wife of George V, Queen Mary, who contributed a letter to the ‘Notes and Queries’ section, and personally corrected proofs of an article on her own collection fans. Predictably, it was during the two world wars that The Connoisseur pinned its colours to the mast, for example in Grundy’s patriotic editorials such as his 1915 ‘Art and the National Economy’. Following Britain’s declaration of war in August the cover images from late 1914 all depict military officers, particularly noticeable being the illustration of Lemuel Abbott’s 1799 portrait of Admiral Nelson, under which is printed the famous words: ‘England expects that every man will do his duty’ (Fig.6). But even in times of peace, national pride shaped the magazine’s content, for instance in March 1930 Grundy called for greater representation of indigenous schools of painting in the National Gallery, writing that: ‘In England alone among civilised countries there always existed an official bias in favour of the purchase of foreign art.’ This political conservatism was often matched by, and sometimes conflated with, a reactionary aesthetics. When The Connoisseur was launched in 1901 the editor clearly stated that: ‘With contemporary art we have nothing to do’. A particularly revealing instance of this was Grundy’s protest in two editorials, in March and April 1920, against the newly founded Imperial War Museum’s purchase of paintings by Wyndham Lewis and C. R. W. Nevinson. Remarkable images like Nevinson’s Paths of Glory (1917) Grundy considered ‘aesthetic heresies’, while his comments subsequently provoked a debate in parliament. In the May issue Nevinson responded with an angry letter accusing Grundy of misrepresenting the facts and misunderstanding his art: ‘I do feel that the Editor of The Connoisseur should know more and abuse less’. Along with a condescending admonition, Grundy gave Nevinson’s letter the very rude title ‘Satan Rebuking Sin’. After Grundy left the magazine in 1932, The Connoisseur was briefly edited by Gordon F. Roe, and then Edward Wenham, before Herbert Granville Fell (1872-1951) took charge in 1935. Fell was 63 years old at the time, and he continued to edit the magazine until, according to his daughter, he died with the proofs in his hand. It seems somehow remarkable that The Connoisseur continued to be published during the Second World War, and even more so that the art and antiques trade continued apace. According to the magazine’s ‘In the Auction Room’, the 1942-1943 auction season was very successful, while it also claimed that the prospects for the new season were, ‘in spite of our being in the fifth year of a grim war, highly favourable’. In 1976 Bevis Hillier suggested that the reason The Connoisseur continued publication was simply to keep the copyright alive. However, if we look at the year 1941 we can see that Granville Fell believed it was his duty to continue to publish, and that by doing so he was making a contribution to the war effort. Admittedly the content had been greatly reduced, but nevertheless the articles often seem to have a clear propagandistic agenda. This can be seen in the very teutonophobic article on the probably imaginary torture device the ‘Iron Maiden of Nuremberg’, a contraption that apparently exemplifies ‘the perverted ingenuity of a sadistic people’, and which in its ‘mechanical, unthinking and impassive execution of the bloody will of despotic masters might well be a symbol of the German people not only of the past but the present as well’. In 1941 Granville Fell used his editorials to provide a connoisseur’s perspective on the war, for example documenting the cultural damage from the Blitz. At this time The Connoisseur also exercised his critical judgement on propaganda, complaining that the British government’s efforts were ‘futile’, and that the Ministry of Information was apathetic, neglectful and inept. The editor also saw The Connoisseur’s transatlantic connection as a means to encourage the U.S to enter the war, as in a ‘War on Culture’ from January. Consequently, Granville Fell could not hide his satisfaction at the signing of the Lend-Lease Bill, which paved the way for America’s entry into the war, and is described by The Connoisseur as ‘The New Magna Carta’. Finally, in September, the magazine showed its allegiance with a cover featuring Gilbert Stuart’s portrait of George Washington. Looking back at the magazine from the twenty-first century, it is clear that one of its most significant aspects was its role in the market, the fact it had a definite commercial function. Just like real connoisseurs, The Connoisseur judged aesthetic quality and monetary value. From its inception one of the more notable regular features of the magazine was ‘In the Sale Room’, a section which in the first issue was prefaced by a colour reproduction of Thomas Rowlandson Christie’s Auction Rooms 1790. Another very visible commercial aspect of the magazine was the adverts. In the early years these occupied nearly the first half of the magazines pages, and were numbered separately with roman numerals. Unfortunately, as The Connoisseur was published monthly and divided into volumes (covering a four-month period 1901-1928, and a six-month period 1929-1961), it was often bound for library collections – a process that involved detaching the advertisement section. Nevertheless, looking at a selection of issues from 1907 we can see that the majority of notices were for antique furniture and home furnishings, but also fine art and announcements of auctions. In March, Henry Graves & Co. Ltd were offering for just over £6 a mezzotint of Lady Hamilton at Prayer, which we are told ‘appeals most strongly’ to collectors of Romeny’s portraits of Emma Hart. In April W. F. Greenwood & Sons Ltd were advertising the ‘unique collection’ of crossbows they had purchased from Sir Ralph Payne Gallwey, all of which were contained in the book The Crossbow by Sir Ralph Payne Gallwey (London: Longmans, Green and Co., 1903). (Fig.7). Running throughout these early years, and promoting the famous art dealership run by the brothers Joseph and Henry Duveen (1869-1939 and 1854-1919), the advert stands in sharp, stylish contrast to other notices marketing fans, old china and suits of armour. The interrelation between The Connoisseur and the arts and antiques trade is an area deserving of further research. However, without intensive quantitative investigation it is impossible to offer a fair assessment of the relationship between the magazine’s articles or illustrations and commercial activity. There is though a reasonable suspicion that there can be established a direct connection between the objects featured and their appearance on the art market. For instance, the pastel Girl with a Kitten seemingly signed and dated by Perronneau, but which the National Gallery only attributes to the artist. As we heard, in 1902 Dorothy Nevill wrote an article for The Connoisseur in which she explains the presence in her collection of Girl with a Kitten by citing her late husband’s fondness for pastels. In 1921 Jospeh Duveen presented the work to the National Gallery, to which he would become a trustee from 1929 to 1936. 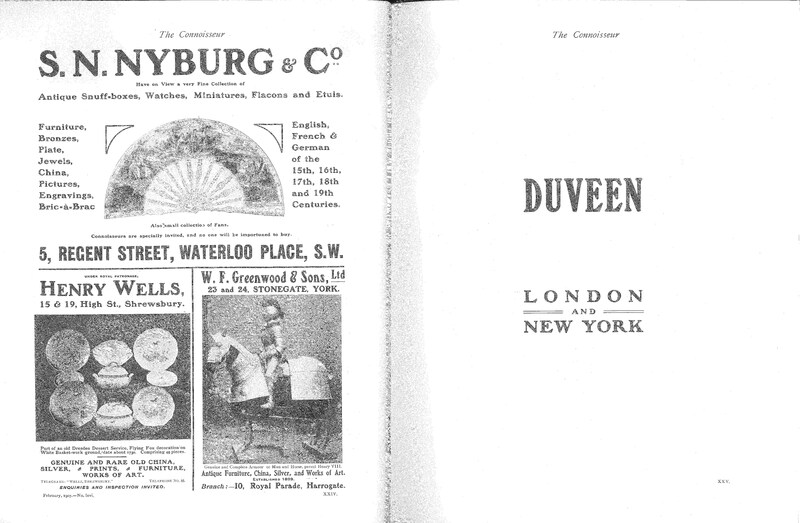 How the work found its way into Duveen’s hands, whether like other parts of Nevill’s collection it was sold in auction after her death in 1913, or whether in fact it was available for sale when The Connoisseur illustrated it in 1909 (explaining its appearance on the cover). These are question that if answered could reveal much about the nature of the art market in the early twentieth century. Lady Dorothy Nevill’s pastel was not included in her 1913 sale (for the ten that were, see the entry on her in my http://www.pastellists.com/Collectors.htm#N). In fact she sold it to Duveen while she was still very much alive – and able to insist that the £1000 she demanded was paid in gold sovereigns. Sadly the date of this is uncertain. 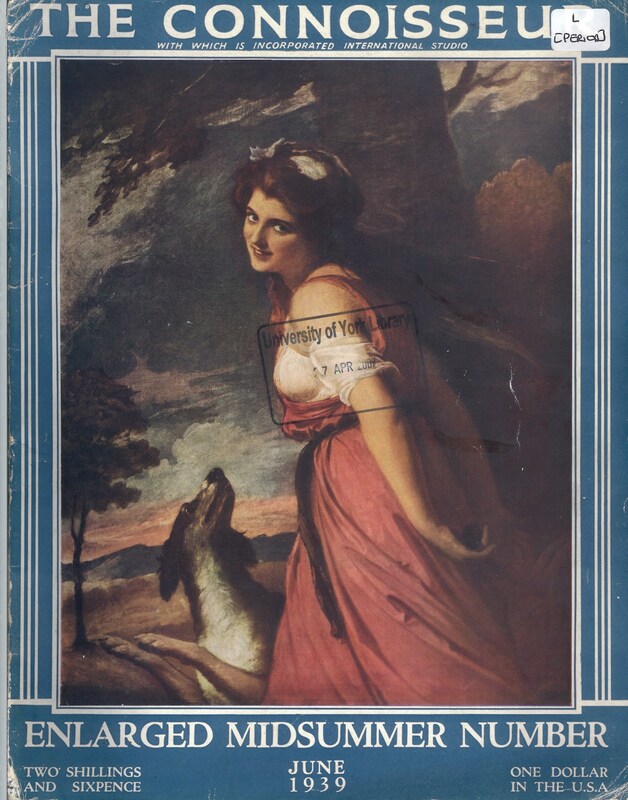 But the colour photogravure from the 1909 Connoisseur cover was in fact made for Haldane Macfall’s French Pastellists of the Eighteenth Century, published that year, and the process was sufficiently cumbersome that these illustrations tended to be reused if possible. Macfall describes it as “private collection”, and, while that might be a euphemism, there is no clear evidence that the work was then with Duveen.